Katharine Houghton Hepburn was born at 22 Hudson Street, which was then opposite the Hartford Hospital. Her mother, Katharine, was a strong willed and intelligent feminist and suffragist. Her father, Thomas, was a doctor who fought for the prevention of sexually transmitted diseases. Both of Hepburn's parents were strong advocates of birth control. Katharine credited her parents for her sense of adventure and independence. Hepburn had five siblings; in 1921, Katharine found her beloved brother Tom hanging by the neck in their aunt's attic while on a visit. It was never determined whether his death was a suicide or a stunt gone wrong, but his death was terribly traumatic for young Katharine, and would haunt her for years. Hepburn attended Bryn Mawr College, graduating in 1928. While in college, she met Ludlow Ogden Smith, who she married. Also at Bryn Mawr, she became active in theatrical productions, and after her senior year she appeared in two productions in Baltimore. That same year, she moved to New York to begin training as an actor, and appeared in her first New York production, The Big Pond. Although she was fired from that show after only one night, she soon found regular work on Broadway. In 1932, Hepburn appeared on Broadway in The Warrior's Husband. Her performance was well received, and led to several screen tests, and eventually to a role in the 1932 film A Bill of Divorcement. Hepburn received excellent notices for her performance in this film. A string of films followed in the 1930s, including Morning Glory, her third film, for which Hepburn received her first Academy Award for Best Actress. In 1933 Hepburn returned to New York to star in the Broadway production of The Lake, which turned out to be a critical and commercial failure. Upon her return to Hollywood, she starred in a string of films of varying quality and success, and by 1938 she was labeled "box office poison" by exhibitors who claimed that people weren't paying to see her films. In 1939 Hepburn again returned to New York to star on Broadway, this time in The Philadelphia Story as Tracy Lord, a role playwright Philip Barry had written for her. The play was a tremendous success, and Hepburn, who owned the film rights (Howard Hughes had bought them for her), sold them to L.B. Mayer and MGM on the condition that she would star. The movie, like the play, was successful, earning Hepburn, Cary Grant and James Stewart Academy Award nominations (Stewart won). Hepburn's next film was Woman of the Year, her first pairing with Spencer Tracy. Hepburn and Tracy would go on to star together in nine films, and would carry on a love affair for 27 years. In the 1940s and 50s, Hepburn continued to appear in films and on stage. In these two decades, she received seven Academy Award nominations, and won two Oscars for Best Actress, for Guess Who's Coming to Dinner and The Lion in Winter. On the London stage, she appeared in three Shakespeare plays in 1955, and toured with them in Australia. In 1957 and 1960 she appeared in four more Shakespeare productions in Stratford, CT. In 1969 Hepburn took a risk by starring on Broadway in Coco, a musical about the life of Coco Chanel. 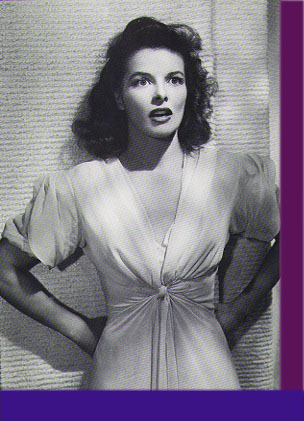 Despite Hepburn's worries about her singing voice, Coco had a successful run on Broadway. Throughout the 1970s, Hepburn appeared in several television movies, including Love Among the Ruins in 1975 with Laurence Olivier, for which she won an Emmy Award. In 1979 she was awarded the Screen Actor's Guild Lifetime Achievement Award. Hepburn's record fourth Academy Award for Best Actress was achieved for her work in the 1981 film On Golden Pond, co-starring Henry Fonda. Hepburn's last film work was a brief appearance in the 1994 film Love Affair. In 1991, Hepburn published an autobiography entitled "Me: Stories of My Life," which gave a rare glimpse into her personal as well as her professional life. Hepburn was romantically linked to several men throughout her life. She had relationships with Hollywood agent Leland Hayward and multimillionaire Howard Hughes in the 1930s. However, her romance with Spencer Tracy was clearly her most important relationship. The two never married, due to the fact that Tracy was already married, and, because he was Catholic, couldn't divorce. However, they were together for almost three decades, frequently working and living together, and Hepburn admits that she loved him. Katharine Hepburn continued to be active even in her old age, riding her bicycle and swimming in the ocean near her house in Old Saybrook, CT. While she was always somewhat reclusive, she appeared in public less and less as she grew older. The last few years of her life, with her health declining, she generally remained at home. Katharine Hepburn died in her home, surrounded by loved ones. [S182] Social Security Death Index (on-line), Ancestry.com, SSDI, Ancestry.com, SSAN 113-12-7384. Ogden Ludlow Smith was born in 1899. He married Katharine Houghton Hepburn, daughter of Dr. Thomas Norval Hepburn and Katharine Martha Houghton, on 12 December 1928. Ogden Ludlow Smith and Katharine Houghton Hepburn were divorced in 1934. Alfred Augustus Houghton married Caroline Garlinghouse, daughter of Leman Benton Garlinghouse and Martha Ann Spalding.1 Alfred Augustus Houghton was born on 6 March 1851. He was the son of Armory Houghton Sr. Alfred Augustus Houghton died on 28 October 1892 at age 41. Alfred and Carrie were enumerated in the 1980 Hamburgh, Erie Co., NY, federal census. He was a merchant, age 29, she was 24. Children in the household were Katherine 2, and Edith 5 months. Tom Hepburn was born on 8 November 1905. He was the son of Dr. Thomas Norval Hepburn and Katharine Martha Houghton. Tom Hepburn died in 1921. [S182] Social Security Death Index (on-line), Ancestry.com, SSDI, Ancestry.com, SSAN 505-34-6708.